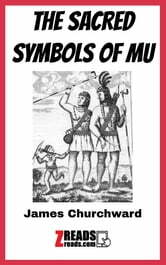 According to Churchward, Mu was a lost continent in the Pacific Ocean, which was destroyed in a global cataclysm tens of thousands of years ago; Mu was the original home of mankind, and all subsequent civilizations descended from it. The Pacific islands and their inhabitants are supposed to be the last survivors of this primordial motherland. Churchward’s Mu was a huge continent, which stretched from Micronesia in the West to Easter Island and Hawaii in the East. He also believed in a literal mid-Atlantic Atlantis. He proposed a global network of huge gas-filled caverns which, if vented, could cause large areas of land to be submerged. He claimed that, while posted in India, he befriended a priest (‘Rishi’), who revealed to him ancient tablets written in an otherwise unknown language. The Rishi taught him how to read this language, Naacal. The tablets described the land of Mu, the Lemuria of the Theosophists. He also claimed that he was able to discern writing from Mu on a mysterious set of tablets discovered in Mexico by an explorer named William Niven.